In October we were invited to join Northern, TPE & other interest groups for two ‘Meet the Managers’ events at Middlesbrough & Thornaby stations. 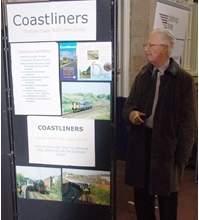 Here is our display with chairman Peter Walker in attendance. Passengers arriving & alighting at Middlesbrough will be well aware of the current access difficulties with the front approach route closed to both road traffic & pedestrians. These photographs show why this has been necessary with the arches supporting the roadway being in danger of collapse. A major redesign/rebuild of this entrance to the station will be required & may take some time.